A week since the Turkish Lira crisis hit the headlines and whilst Erdogan and Trump play out a diplomatic tussle, the Turkish lira improved from record lows after Qatar’s Sheikh – Thamim bin Hamad Al Thani – said Qatar was standing by it “brothers in Turkey,” as he announced a $15bn investment into the country’s financial markets and banks. But why has Qatar entered the scene and helped to temporarily, temper the crises. I’m Kasim, this is KJ Vids and in this video, we will look at the Qatar-Turkish alliance and the motive that Qatar has in allying with Turkey. Who was behind the Turkish Coup? On the night of 15th July 2016, roads were blocked on the Bosphorus Bridge in Istanbul and jets were flying over the Turkish Parliament in Ankara. Tanks brought Istanbul to a standstill as soldiers invaded the headquarters of the ruling party, seized control of the State broadcaster and announced that the army was in charge. But the next day it was clear that a military coup attempt had failed. More than 250 people including the coup plotters, civilians and loyalist officers were killed and many more injured. The Turkish government blamed the failed coup attempt on Fethullah Gulen, a Turkish preacher and former Erdogan ally who has long been living in self-imposed exile in the United States. A state of emergency was declared and anyone who appeared to have the faintest link to Gulen and his supporters was punished swiftly. In a matter of weeks, tens of thousands of people in the military, police, judiciary, civil service and education were detained, suspended or sacked for alleged links to the Gulen movement. But Gulen told VOA’s Turkish Service Erdogan had falsely accused him, and that he wouldn’t have returned to Turkey even if the coup had succeeded. Other observers have speculated that the coup was stage-managed to give Mr Erdogan an opportunity to purge the military of opponents and increase his grip on Turkey. It remains to be known who was behind the coup, but one thing for sure is that the coup has been used by both Erdogan and Gulen to cast themselves as victims of repression. Gulen also highlighted his victimhood as a political outsider and former political prisoner when he was interviewed during Friday’s dramatic events. Research suggests that this ratcheting up of victimization rhetoric could have important attitudinal and electoral consequences. Kimberly Guiler, in a paper recently discussed at the Project on Middle East Political Science (POMEPS) annual conference, finds that voters in Turkey are more likely to feel positively toward candidates who cite experiences of political suffering in their biographies. Israeli Prime Minister Benjamin Netanyahu receives extremely negative ratings from nations in the Middle East and North Africa. 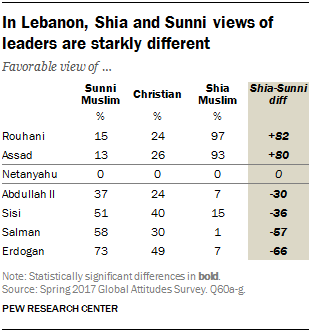 Only 7% in both Tunisia and Turkey, 1% in Jordan and 0% in Lebanon have a favorable view of Netanyahu. 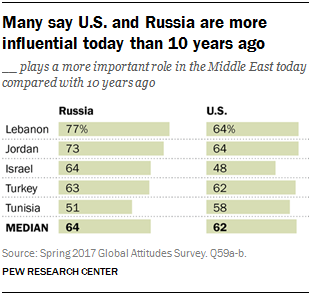 And the negative opinion in Jordan and Lebanon is particularly intense; 95% of Jordanians and 97% of Lebanese say they have a veryunfavorable view.